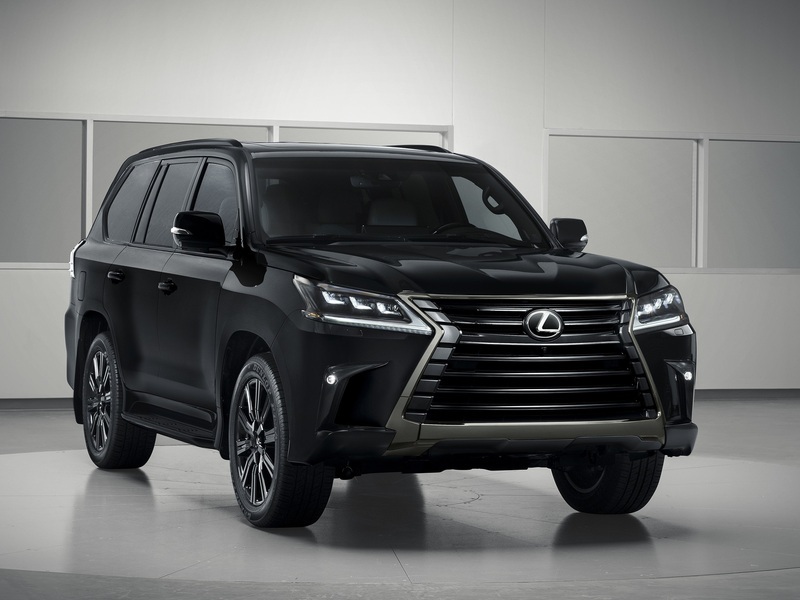 The Lexus LX 570 is a luxurious mammoth of an SUV. It's posh, spacious, and menacing with its huge spindle grille. But it is long-in-the-tooth and hasn't been redesigned since back in 2008. That's a very long time, too long, actually. Well, it looks like Lexus plans on hanging on with the current model a tiny bit longer as evidenced by the LX Inspiration Series you see here. It might just be the final permutation of the big beast, and it's expected to show up at the upcoming L.A. Auto Show. Though there's nothing truly new on the Inspiration Series that's a huge departure from the regular LX, it does look very different thanks to copious use of dark chrome and black trim all over the body that happen to make the LX look smaller than its actual gargantuan dimensions. And a big one it is with room for seven, a corpulent 6,000 curb weight, and a huge 5.7-liter V8 engine that delivers 383 horsepower. It's clearly no shrinking violet of a vehicle. The black chrome everywhere makes for a more muted but still dramatic look. Inspiration apparently comes in the form of black paint, black wheels, black headlight and taillight trim, black window trim, and even smoked black headlight lenses, black chrome grille, license plate surrounds, and few more trim bits on the body. It's all very well done, even though the body hasn't changed in over a decade. We really do like the look from just about every angle, but that grille on this SUV still bugs us. Open the doors, and there's a stark contrasting white leather interior. Don't worry, there's still some black leather trim inside to provide a balance, giving the LX Inspiration a two-tone appearance. Nothing else inside the LX is different from the regular model. It's still just as spacious and opulent as before. The 'saddle shoe' white and black interior is a welcomed update to a dated model. What the Inspiration does provide is an LX that has all the optional bells and whistles. It gets a four-zone climate control (two for the front row and one each for the 2nd and 3rd rows), heated/cooled rear seats and projector door lamps. The rest of the standard goods include features such as a 12.3-inch high-resolution split-screen multimedia display, artisan wood trim, ambient lighting, 14-way power adjustable driver's seat (12 for front passenger), illuminated running boards, the full Lexus Safety System, and intuitive parking assist. Pricing is a bit higher than the base LX. The Inspiration comes in at $101,715 including destination charges. You do get a lot for your money, but it's still a pricey steed. The question is whether or not you'll plunk down six figures for a fancier version of an aging model.